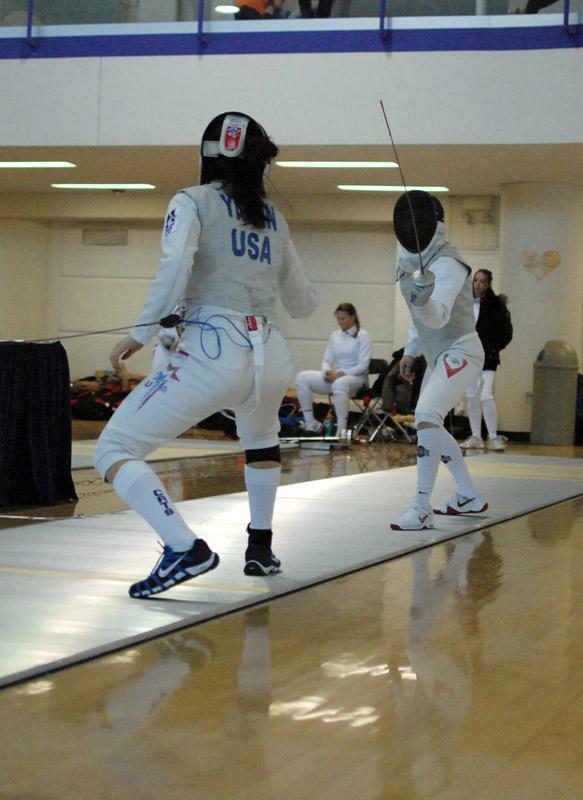 Freshman foilist Jen Yamin competes during the NU duals. Yamin and the Wildcats will participate in the Duke duals this weekend. When asked about Northwestern’s match against Princeton last weekend, coach Laurie Schiller let out an audible groan. But it was an optimistic groan. Even without the win, the Wildcats have a lot to be confident about after staring down the country’s top team because at this point in the season, there’s still a next time. “Regular season is interesting because at the end, you see who learned the most from their losses,” senior Dayana Sarkisova said. NU has had its share of challenges this season. With injuries plaguing many of the team’s top competitors, the Cats have had to rely heavily on their freshmen class. Sarkisova has been battling an ankle injury through the first part of the season but has already picked up 33 bout wins in just two weeks. For sophomore Courtney Dumas, it’s her knee that’s been the problem, but that hasn’t stopped her from taking out her toughest competition. She has won 81 percent of her bouts this season, and in NU’s thrilling match against Princeton, Dumas scored a critical bout win over bronze medalist Scanlan to help keep her team in contention against the Tigers. After a dramatic weekend at home, NU will be back on the road at the Duke Duals on Sunday. The Cats’ toughest competition will be No. 5 Penn State, a team that holds a 17-5 lifetime record against NU. But the two teams have not met since 2009, with the Nittany Lions getting the upper hand in that match 20-7. Duke, MIT and UNC make up the rest of the weekend’s lineup, and while all are top-20 teams, NU has won 75 percent of its matches against them combined. Last weekend’s near-upset has given the Cats an extra spring in their step heading into their next competition, but with such a young team, there’s still work to be done.